Kangzhan: Guide to Chinese Ground Forces 1937 - 45 is the first ready reference to the organization and armament of Chinese ground forces during the Sino-Japanese War of 1937 - 45. The work integrates Chinese, Japanese and Western sources to examine the details of the structure and weapons of the period. Recent scholarship has contributed greatly to our understanding of China's role in the war, but this is the first book to deal with the bottom-level underpinnings of this massive army, crucial to an understanding of its tactical and operational utility. 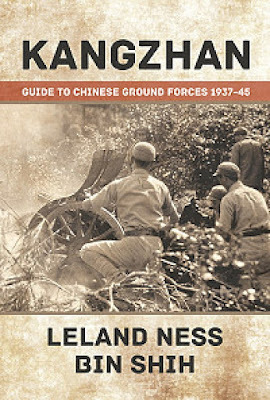 An introductory chapter discusses the military operations in China, often given short shrift in World War II histories. The work then traces the evolution of the national army's organizational structure from the end of the Northern Expedition to the conclusion of World War II. Included are tables of organization and strength reports for the wartime period. The armament section illustrates and details not only the characteristics of the many and varied weapons used in China, many seen nowhere else, but also their acquisition and such local production as was undertaken. This is complemented by a chapter on the arsenals and their evolution and production programs. The Chinese army was one of the largest of the war and it, and Japan's, fought longer than any other. It faced unique challenges, including fragmented loyalties, huge expanses of territory, poor logistics networks, inadequate arms supplies, and, often, incompetence and corruption. Nevertheless, they fought bravely in major battles through 1941 and were able to counterpunch effectively in important regions through the rest of the war. Aimed at both military historians and wargamers, this work fills an important gap in our understanding of this, the most under-appreciated army of the war. Contains c 250 b/w photos, 3 maps, 60 tables.